Iam working in department of Post and got MACP-2 on 17.05.2017 . In 6th CPC the grade pay will be 2800 to 4200 and which most benefit to me . But the 7th CPC is implemented with effect from 01.01.16 .Shall I take the 7th CPC from the date of my MACP-2 ie 17.05.2017 by re-excersing option. Our accountant says that there is such provision. Please clarify shall I eligible to take the 7th CPC from the date of my MACP-2 by refunding the pay of 7th CPC till my MACP-2 ie 17.05.2017. If it is normal designated promotion you will get lower benefit, but it is MACP-2 it will be benefited in matrix level 6. I was PSU absorbee in 1984 3cpc. worked as Extra Asst. Diir in cea/min.of power. ppo#136 170 300 104.I was in 650- 1200 scale with Rs 880/- as my 10 months average basic pay. I am engineering graduate. please clarify my following doubts. 1.what is my grade pay 4200/4600/4800? My BP was 13690 GP 2800 as on 31 Dec 2015. I got my first MACp on 01 sep 2008. I was promoted on 03 mar 2016 with GP 4200. 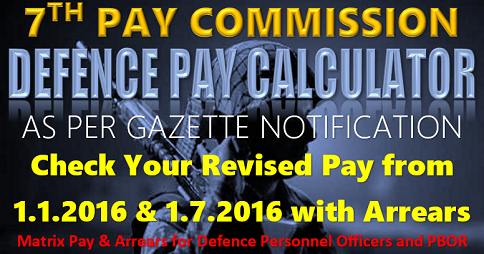 How much my pay fix as per 7th pay commission as on 01 jul 2016. As per your basic pay as on 31/12/2015 of ₹ 13690+2800=16,490 × 2.57 = 42379.30 fixed at 42800 in matrix level 4 GP& from 1/3/16 due to Promotions it will be fixed as 43600 then due to increment postponed on January, 17 as ₹ 44,900/- in Matrix level 5. But you have to give option for promotion & increment. My PPO/028256/2000. 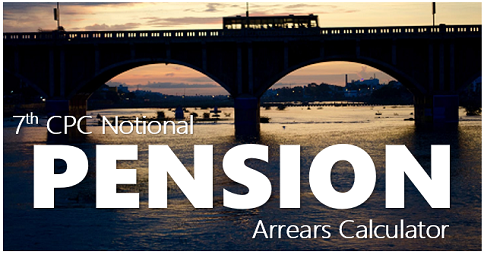 Fixed medical allowance with arrer since 2004. My ppo no s/028256/2000,new ppo not received. I was working in the office of central govt, at GRADE PAY 2800 with basic pay of 31000/- . I technically resigned from the office and joined the job in lower grade pay 2400 at what amount my pay will be protected. At ₹ 31,400/- if it’s proper channel. I was getting 53600 in level 8 of GP 4800 upto December 2016 after getting annual increment on 01.07.2016. From January 2017 I promoted to higher post of Group A – 5400 GP in Level 10. As per new rule will my basic revise ? Answer to A N MISHRA : No. 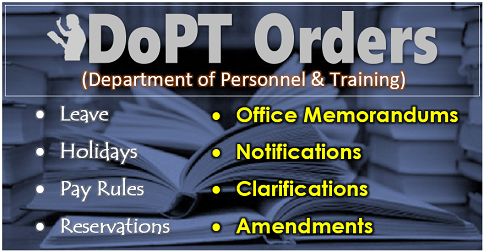 As per the 7th CPC rules no promotional monitory benefits, only designation changes. By way of MACP of every 10 years pay will be upgraded as next matrix level changes. 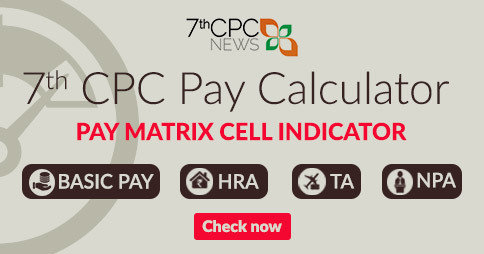 Are upgraded grade pay in the seventh CPC, eligible for bunching? Answer to A K SINHA : Yes with additional one increment in same level and fixed to nereast amount of stage in next level for upgradration in MACP. 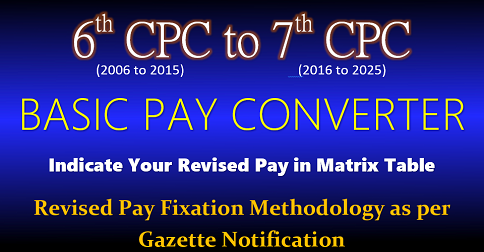 I am asking only for upgraded grade pay by seventh cpc not macp. Eg. 4200 gp is upgraded with 4600 go. Due to upgradation can Senior officers claim bunching from juniors officers if differences more than 3% in the basic. However both officers have joined in sixth CPC. Therefore no one r having basics below the entry pay. Explain how is it determined? 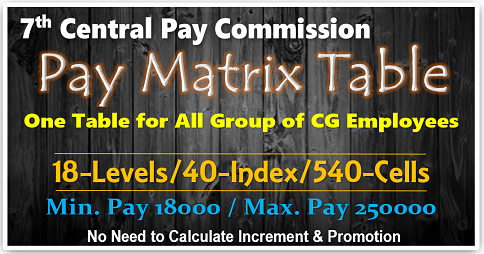 There is no grade pay in 7th Central Pay Commission only MATRIX LEVELS. I am working 18 years in PB-1 and now i will join with the new post of PB-2. What will be my monthly pay of my new post. Answer to RICHARD – PB-2 of 6th CPC starts from Rs.9300-34800 with GP 4200, in 7th CPC MATRIX LEVEL 6 of Rs.35,400/- it depends upon your starting basic pay and scale of pay (promotions/MACP if any) of Grade Pay it will be fixed at new post of matrix levels. Your next MACP on completion of 10th year on 16/2/2022 from that day upgraded your pay in level 8 and getting one additional increment in matrix level 7 and pay fixed in level. 8. In the 7th CPC no monitory benefits for any promotions. 25/01/2016 promoted as “Office Superintendent” same grade pay Rs. 4600/- not received any monetary benefit and on dated 30/07/2018 promoted as “Administrative Officer” is same grade pay,Rs. 4600/-, can I get any monetary benefit? Pl give reply early as possible because I want to give option form to the department. 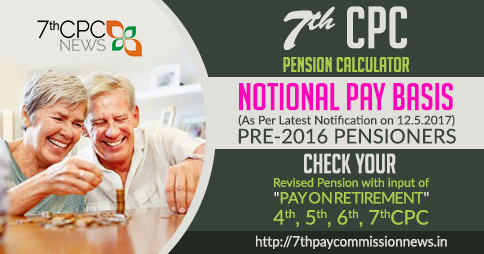 Accordingly my new pay as per 7th CPC = Rs.52000 ( Cell 6 in level 7 of pay matrix ) based on the option exercise with effect from 01.01.2016.
i retired on superannuation = 29.02.2016 A/N.My last date of increment is 01.07.2015. I have served 8 months after my last increment and before my retirement. Whether i am eligible to get an additional increment. Because as per the 7th CPC recommendation the minimum service required is 6 months to get an increment. No, Actually increment counts service of one year, in the middle if any upgradations of pay as MACP in the 6th CPC grade pay changes & in the 7th CPC as next matrix level of pay.